Visit our St. Louis office for Custom LASIK laser eye surgery to dramatically improve your vision and lessen your dependence on glasses or contacts. Contact us today to get started. "I always said growing up that if I ever had enough money to buy anything I wanted, it would be a new set of eyes. I am now 38 years old, the money still is not here, but the financing and technology have made it so you can afford things. So I did it, got the surgery, and I am more than happy to make a payment each month for a dream that has come true." At the Mulqueeny Eye Centers, serving St. Louis, our eye surgeons perform LASIK laser eye surgery, including Custom LASIK, to enhance our patients’ lives. LASIK is a vision correction method for active people or anyone who is simply tired of reliance on glasses or contacts. With Custom LASIK using the ALLEGRETTO WAVE® EYE-Q laser with Wavefront Optimized™ technology, the eye surgeons at Mulqueeny Eye Centers are now able to offer patients vision correction options that allows us to go a step beyond the correction provided by glasses, contact lenses, and conventional LASIK laser eye surgery. To understand how Wavfront Optimized™ technology works, consider that the eye is much like the tip of an egg, steeper in the middle and flatter on the sides. With older generation lasers, treatment was centered on the front of the cornea. This resulted in an abrupt edge and caused unwanted side effects like poor night vision, glare and haloes. The ALLEGRETTO WAVE® EYE-Q laser technology changes all of that. It delivers laser treatment to the sides of the cornea as well as to the center, preserving the eye’s natural shape. In this way, we are able to customize each patient’s LASIK laser eye surgery treatment to their unique eye shape, resulting in what can only be described as “high performance vision” and achieving the most accurate level of correction possible. The doctors at our St. Louis area center offer each patient a comprehensive LASIK laser eye surgery evaluation and consultation prior to surgery. At this stage, we'll answer any questions you might have, so that you can decide if LASIK vision correction is right for you. Visiting our Web site is the first step to learning about the LASIK procedure; the next step is to contact Dr. Sean Mulqueeny and our staff to schedule your consultation. Am I a candidate for LASIK Vision Correction? 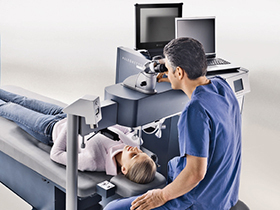 In 1995, a procedure called Laser-Assisted Stromal In-situ Keratomileusis (LASIK) became available in the United States for the treatment of myopia and astigmatism. The procedure has gained popularity, and now LASIK and other types of refractive surgery such as PRK/ASA and refractive lens implants help hundreds of thousands of patients a year overcome nearsightedness, farsightedness, and astigmatism. Our LASIK laser eye surgery center is located in St. Louis and draws prospective LASIK patients from the surrounding Missouri areas. LASIK vision correction is a procedure that uses a laser to change the shape of the cornea (the clear window of the eye) and is used to treat low to high levels of nearsightedness, farsightedness and astigmatism. It is performed by creating a flap in the cornea using an instrument called a microkeratome. During this process, you may feel a little pressure, but no pain. Once the flap is created, the microkeratome is removed, and the corneal flap is gently folded out of the way. Next, your laser treatment will be applied, and in most cases will be completed in just a matter of seconds. During this time, you will be asked to look directly at a target light while the laser reshapes your cornea and corrects your vision. To finish the procedure, the protective flap is folded back into place where it bonds without the need for sutures. All said, from start to finish, the laser procedure takes about ten minutes to perform per eye. In just twenty minutes or less, you can dramatically change your vision and life! The technique used during LASIK eye surgery is the same, whether it is performed for the treatment of myopia (nearsightedness), hyperopia (farsightedness), or astigmatism. The difference lies in how the central part of the cornea is shaped during the procedure. For nearsightedness, the laser removes tissue from the center of the cornea, flatting it in order to allow light rays to focus on the retina – the back of the eye. For farsightedness, the laser is directed to the periphery of the cornea making the central cornea steeper. During astigmatism correction, the laser sculpts the cornea in a manner to result in a more spherical shape following the procedure. Astigmatism treatment is often combined with treatments for nearsightedness or farsightedness. The common goal in all laser eye surgery treatments is to focus light entering into the eye directly on the Retina, the back of eye, for crisp, clear vision. Following the laser treatment, the flap of cornea is repositioned. Healing after a LASIK procedure is quick, with visual recovery usually occurring within 24 hours. LASIK is a safe and effective way to improve your vision! Many patients who have undergone LASIK eye surgery often wonder why they waited so long to get it. Am I a candidate for LASIK Laser Eye Surgery? Today, almost anyone with refractive vision problems (nearsightedness, farsightedness, and astigmatism) may improve their vision through laser vision correction procedures, allowing greater freedom from glasses or contact lenses. To find out if you are a candidate for LASIK laser eye surgery, visit our St. Louis office for a free, complete LASIK evaluation. During this appointment, we will determine your visual needs and assess the health of your eyes as well as your expectations for the surgery. Many factors are considered before we can help you decide whether LASIK or another type of vision correction is a good choice for your individual needs. Located in St. Louis, Missouri, we are your source for custom LASIK laser eye surgery. Visit Mulqueeny Eye Centers and learn how LASIK can decrease or eliminate your dependence on glasses or contacts by correcting nearsightedness, farsightedness, or astigmatism.